I sent deltatre a tweet last week asking what was happening with their Sochi 2014 Paralympic coverage and they responded that visually impaired skier Kelly Gallagher and guide Charlotte Evans won the first ever winter Paralympic gold medal for Great Britain. Channel 4, with support from deltatre, was at the Rosa Khutor Alpine Centre in Russia to broadcast the history making Super-G event to TV and mobile device users. The Sports Techie community blog is privileged to once again provide our readers with the latest information about deltatre helping Channel 4 with their Sochi 2014 Paralympics coverage, following their award winning London 2012 team efforts for the winter Paralympic games viewers in the UK. Digital audiences are enjoying sports media and technology leader deltatre’s host of digital products and editorial services to augment Channel 4’s Paralympic broadcasts with in-depth, multi-platform coverage. 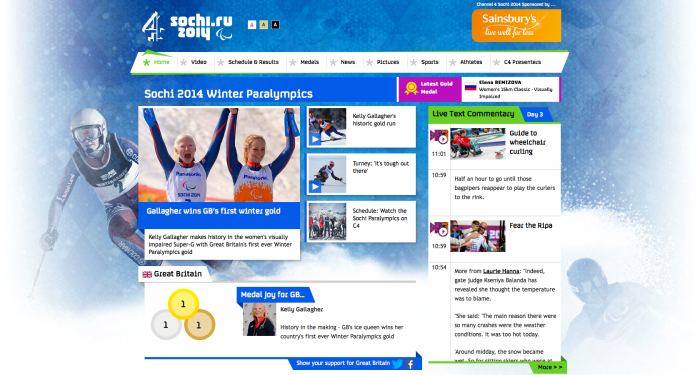 The fact that deltatre designed and built C4’s Sochi 2014 website paralympics.channel4.com compliments the fact that deltatre is also providing Channel 4 with a suite of sports tech services to enhance the broadcaster’s biggest ever TV commitment to Winter Paralympics. By integrating deltatre’s live sport services such as real-time results data delivery, live video streaming and highlight clip production, with it’s award-winning products including the Diva video player and LiveBlogging tool, deltatre is supporting Channel 4 to bring audiences an additional 100 hours of live digital sporting coverage. Channel 4’s first-class television programming from Sochi also features additional deltatre editorial and social media coverage. Focusing on digital platforms, deltatre’s expert team of commentators, journalists, live bloggers, producers and editors are entertaining online audiences with insightful competition analysis and behind the scenes stories, photos and videos from around the Games. I like that deltatre’s digital editorial team is setting a sport business model by enhancing not only Channel 4’s TV coverage but also contributing to the programming with onscreen social media integration of trending Twitter topics and comments by athletes, public figures and the community. The Sochi 2014 Games are the second Paralympics on which deltatre and Channel 4 have collaborated. In recognition of their coverage excellence during the London Games, the team was presented the British Academy of Film and Television Arts (BAFTA) Award for Digital Creativity in 2013. Ever since the Paralympics debuted at the 1998 Winter Games in Nagano, sports tech has been right alongside helping to even the playing field. The adaptive sports racers follow right behind race guides hoping to see what they can of the colorful bibs over there catsuits as they pick up speed down the mountain while communicating on Bluetooth radio headsets. The radio headsets are used to transmit audio, instructions and directions. According to the Independent, Gallagher never imagined she could ever ski herself since she has a form of albinism. Her favorite toy as a girl was a skiing Barbie. Kelly picked up inline skating as a youth, not knowing that the childhood commitment she made to sports would eventually earn her a trip to the Olympic podium while never using a white cane along the way to get there. During a holiday trip with family to France, Gallagher asserted her gold medal will during her first ski lesson at Andorra. Because of her courage and love of sport, Winter Paralympics history for Britain was made with the help of Sports Techie guide and best friend, Charlotte Evans, and their headset. The pairs Olympic dream became reality thanks in part to sports technology captured beautifully by C4 and deltatre. With staff in Torino, London, Manchester, Lausanne, Paris, Munich, New York, Portland, Sydney, Miami and Mumbai, deltatre has over 25 years’ experience at the highest level of international sport. Always striving for the next level of interaction, we consider the future of global sport engagement to be multi-platform and social. Sports Techie, Covering the focused support on high-performance Paralympic sports broadcasting by Deltatre and C4 makes their collaboration on the Sochi 2014 Paralympics something I truly looked forward to. Bravo to Kelly for mastering the Super-G ski course as if she had no visual impairment, something seen on Channel 4 while powered by deltatre technology and content. In order to be a Paralympian for TeamGB, TeamUSA or any other country, your financial support is needed. The Paralympic sports movement in Ireland, the UK and elsewhere across Europe has never been more popular with participating nations, athletes and fans. As a result, sponsors have committed to this fast-growing event in both the summer and winter. Sochi Paralympics television coverage has set records for number of hours here in the U.S. on the NBC Sports Network. All this means to expect even more epic and historical Paralympic moments integrated with innovative sports technology while being captured by the team of deltatre and C4 for British audiences worldwide.